What did the guy think was going to happen? Did he not know anything about the character of the main players? (Just look at who is standing around Obama in the signing pic!) And so he now claims to stand with Hobby Lobby and other organizations and individuals who oppose the HHS contraception mandate. 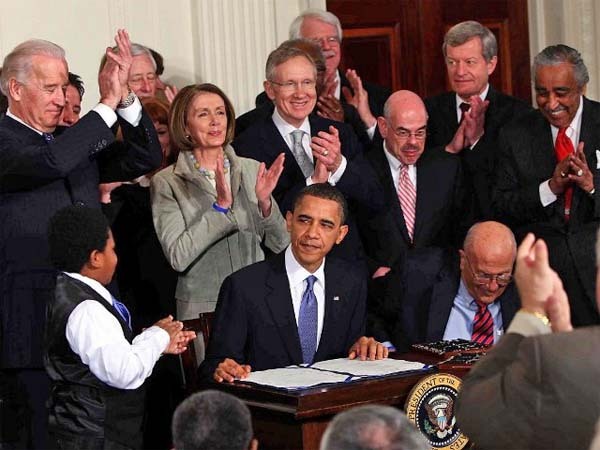 Now, this reaffirmation of Stupak’s faith in Obamacare dates to March 11, 2014, when one failure after another, one lie after other on the part of the Obama administration had been exposed to public view and ridicule. Which makes me wonder if Stupak is really serious in his disclaimer, or whether he had imbibed so deeply of Party ideology that he has no independent reasoning ability left. I keep hoping he is serious,; but either way, his non-disclaimer disclaimer reminds me of the hundreds – nay, untold thousands! – of Party faithful whose minds had been so twisted by blind faith that, despite being innocent, they had willingly gone to their deaths at the hands of murderous regimes just to prove that their Party was always right. To help understand this phenomenon, I heartily recommend The Invisible Writing, the second volume of Arthur Koestler’s autobiography. This entry was posted in bureaucracy, community organizers, corruption, Democrats, health care reform, loss of freedom, misuse of language, Obama, Obama administration, scientific fraud, socialism, The One Party, unelected bureaucrats and tagged Arthur Koestler, contraception mandate, Democratic Party, freedom of conscience, HHS, just plain stupid, loss of freedom, Obama dictatorship, Obamacare, Sebelius. HHS, socialism, Stupak. Bookmark the permalink.